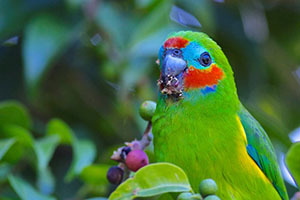 Michael Snedic, one of Australia’s most accomplished wildlife photographers and tutors, has again teamed up with Barry Davies, a highly respected and experienced Birding Guide, to present an 8 day bird photography workshop and tour, in Tropical North Queensland. In this workshop, Barry’s immense birding experience will help participants find and identify numerous species of birds by studying their behavior, habits and habitat. Michael’s experience as a leading bird/wildlife photographer and tutor will also be utilised to help you improve your bird photography, including tuition on birds in flight, composition, lighting and correct exposure, focal points and much more. The Atherton Tablelands is arguably Australia’s youngest landscape being formed from volcanoes as recently as 25,000 years ago. The rich volcanic soils were once covered with rainforest most of which has now been cleared for agriculture. The precious rainforest remnants, which are protected in National Parks, provide habitat for a large diversity of wildlife including twelve wet tropics endemic bird species: Atherton Scrubwren, Bower’s Shrike-thrush, Bridled Honeyeater, Grey-headed Robin, Macleay’s Honeyeater, Mountain Thornbill, Pied Monarch, Tooth-billed Bowerbird, Golden Bowerbird, Victoria’s Riflebird, Chowchilla and Fernwren. In recognition of the areas rich diversity of birds Birdlife International has classified the Tablelands a Key Biodiversity Area (KBA). Southern Cassowaries are also present as are Sarus Cranes and Brolgas who together stage one of the least known, but most spectacular, daily wildlife events in Australia when they fly in at dusk to roost at Bromfield Crater. Vast numbers of water birds periodically gather at Hastie’s Swamp to create yet another magical wildlife experience. Landscape features like the crater lakes, Barrine and Eacham, the dramatic Hypipamee Crater and the famous Curtain Fig are major attractions in the region. The workshop will start with one night in Cairns. That is the day when everyone arrives. There will be an introductory photographic session in the afternoon. En route to the Atherton Tablelands on Day 2 we will visit a property in Kuranda to get close-up views of Cassowary. 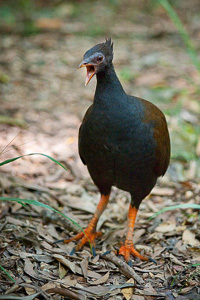 The owners of the property have been providing a safe-haven for wild Cassowaries for over 40 years by protecting their habitat and controlling feral dogs and pigs, the main predators of Cassowary. Our base for most of the workshop is Chamber’s Wildlife Lodges. 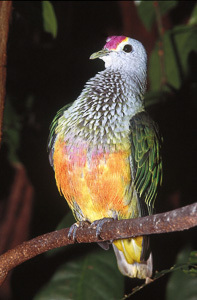 Set in the tropical rainforest near Lake Eacham, the lodge is a haven for birds and mammals. 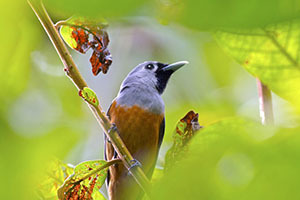 Victoria’s Riflebird and Spotted Catbirds regularly visit the cabins and many other species are found in the surrounding forest. Striped Possums and Sugar Gliders feed in a special viewing area at night. During the next four days there will be a series of bird and photographic workshops and lectures at Chambers and other special locations including Mt Hypipamee National Park, Lakes Eacham and Barrine, Wongabel State Forest, Hastie’s Swamp, Nerada Tea Plantation (Tree Kangaroos), Peterson’s Creek (Platypus) and the Curtain Fig and the Cathedral Fig Trees. Evening trips to Bromfield Crater for the Cranes and near Atherton for Grass Owls should provide challenging photographic opportunities. This is the day we would like everyone to arrive. Our first workshop session will be an introduction to the group and leaders, an overview of the week and an explanation of the basic camera settings. Michael will also check everyones settings. This session will be outside on the Cairns Esplanade, a wonderful location for birding and probably the best location in Australia for observing and photographing shore birds. The time will be determined by when everyone is able to get there but we ask that participants aim to be in Cairns by early afternoon. Our first group dinner will a Balinese banquet at the award-winning Bayleaf Balinese Restaurant. We start the day with a walk along the Cairns Esplanade where there will be plenty of birds to photograph. The tide should be favourable for wading birds and there is always a good selection of species in the trees including Double-eyed Fig Parrots, Torresian Kingfishers and Varied Honeyeaters. After breakfast, we start our journey to the Atherton Tablelands. Our first stop is near Kuranda where we hope to see and photograph the most iconic North Queensland bird, the Southern Cassowary. 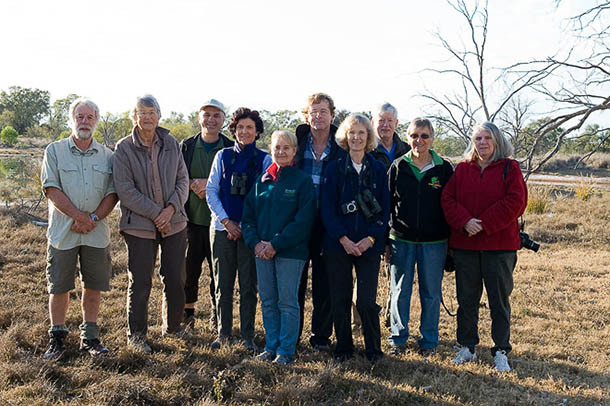 Davies Creek National Park is our next opportunity with highlights being Rufous Owl and White-browed Robin. The creek flowing over granite boulders is a very photogenic landscape. South of Mareeba Red-tailed Black-Cockatoos often frequent the roadside Eucalyptus trees. After settling in to Chambers Wildlife Lodges , our accommodation for the next 5 nights, most of the rest of the day will be devoted to learning how to find and identify birds with Barry. This session is cameras down binoculars up so that you concentrate on learning the skills of finding birds by sight and sound, identifying them using field marks and observing their behaviour. You have the rest of the week to practice these skills and get your photographs. Set in the tropical rainforest Chambers is an ideal location for this workshop. 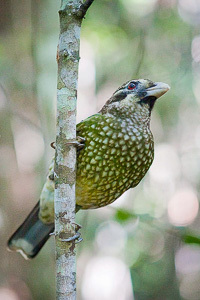 Over many years Victoria’s Riflebird and Spotted Catbirds have been encouraged to visit feeders and the cabins and many other species feed in the surrounding forest and gardens. Dinner that evening will be at Chambers. After dinner, Barry will give a presentation about identifying birds and an overview of the birds of the area. 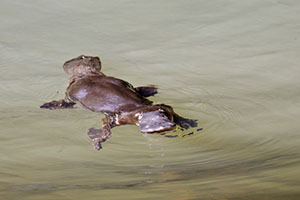 Visits will also be made to Petersen’s Creek to see Platypus, Nerada Tea Plantation for Tree Kangaroos, Bromfield Crater for the Crane fly in and at Chambers spotlighting for wildlife including Striped Possum, Sugar Gliders and Sooty Owl. Lunches will be at the Teahouse at Lake Barrine and Nerada Tea and pack lunches at various locations. Dinners will be at Chambers Lodges, Malanda Hotel and Yungaburra Hotel. Barry and Michael will be available for private sessions and advice throughout the workshop and there will be some free time for you rest or just to spend time birding or photographing on your own. We return to Cairns but by one of 3 possible routes. Which one will be determined by what we have or haven’t seen and photographed. 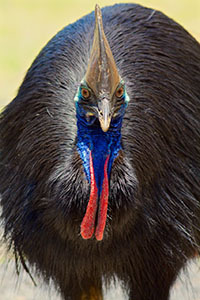 For example, if we didn’t see Cassowary on Day 2 we can try again. Back in Cairns there are many options including the Botanic Gardens, Centenary Lakes and, of course, the Esplanade. Today we visit the Great Barrier Reef at Michaelmas Cay on the catamaran the “Ocean Spirit”. The Cay is a sanctuary for breeding sea birds especially Sooty Terns, Common Noddies and Brown Boobies. Great Frigatebirds are usually present along with a range of interesting tropical terns. 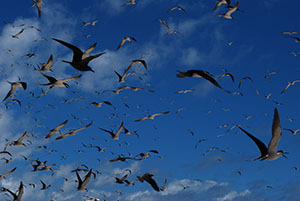 There are thousands of birds either sitting on nests or flying above the cay. This is the perfect opportunity to practice your bird photography skills especially birds in flight. The only problem you will have is choosing which of the thousands of birds to shoot. Human visitors are limited to a small area of the beach and the rest of the cay is for the birds. The birds nest right up to the rope that keeps us out and often sit on the rope so you won’t have any trouble getting close. It is not a day for big lenses. There is also the opportunity to snorkel so pack your underwater camera. That evening we will have our final dinner and wrap up of the workshop. Breakfast in the restaurant is included. Time to go home. 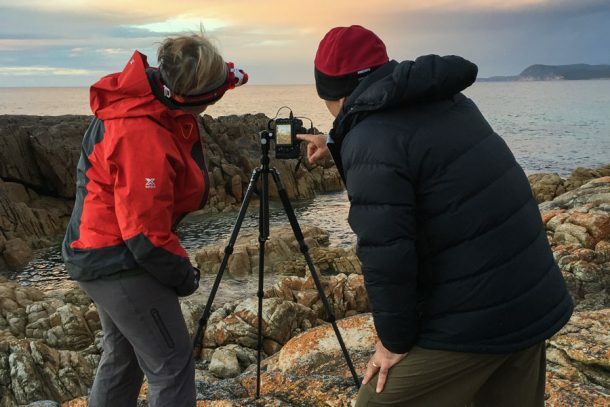 The 8 Day Bird Photography Workshop with Michael and co-tutor, Barry Davies, is an unforgettable birding experience with a few mammalian surprises thrown in for good measure! 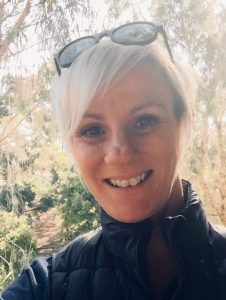 As a keen bird photographer, I know that it takes a lot of local knowledge, time, travel and expertise to maximise your opportunities to view and photograph endemic and target species. With 8 days- you need to rely on the experts to make the most of your time and Michael and Barry make the perfect combination! Barry will find you the birds and Michael will make sure you get the shots you want!!! 8 amazing days turned into 5101 images, 179 bird species observed, 13 other fauna species (not including fish) and 42 new birds for my list! The trip was seamless- the guys will make sure that you are feed and watered exceptionally well and have very comfortable accommodation for a well deserved rest each evening. I thoroughly recommended this fantastic bird photography workshop for anyone interested!! Eight nights accommodation, including the Bay Village Tropical Retreat in Cairns and Chamber’s Wildlife Lodges at Lake Eacham on the Atherton Tablelands. Drinks other than those supplied with meals i.e. water will be supplied at all meals, juice and tea and coffee at breakfast and juice with lunch, if it is a picnic lunch. Flights to and from Cairns and transfers from Cairns airport. Maximum 10 passengers with two experienced tutors/guides. - SLR camera versus Compact Digital Camera?